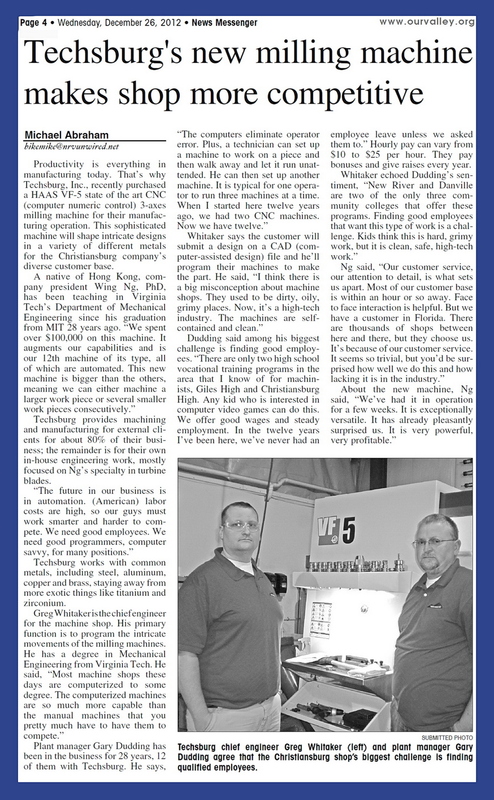 In Dec 2012, Techsburg manufacturing division has added a HAAS VF-5/40 VMC to meet customers’ demands. When Hong Kong native Wing Ng arrived in Blacksburg to teach Mechanical Engineering at Virginia Tech 28 years ago, he thought it would be a short-term stepping stone. He’s still there, with no plans to leave. The 56-year-old Ng’s specialty is gas turbine engines, used primarily in aircraft and power generation applications. From his research work, he spun off a company 15 years ago called Technology in Blacksburg, now Techsburg, housed in The Threshold Center in the Christiansburg Industrial Park.